The campaign to get a bypass around Worthing has been extended into Lancing and Sompting. Around 50 signs have been erected by residents living along the A27 in Lancing and Sompting, stretching from Busticle Lane to the east side of Lancing Manor roundabout. This has been organised by the Bypass Not A27 Throughpass residents’ action group. 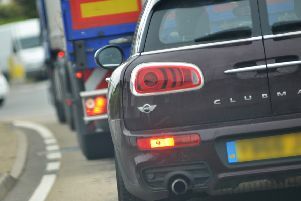 Chairman Jack Delbridge said: “Highways England have said that the group’s proposal for a northern relief road would cost between £500 to £600 million. Information about the group, how to join the campaign and to sign their online petition is available atbypassnota27throughpass.org. Email bypassworthing@gmail.com for details.